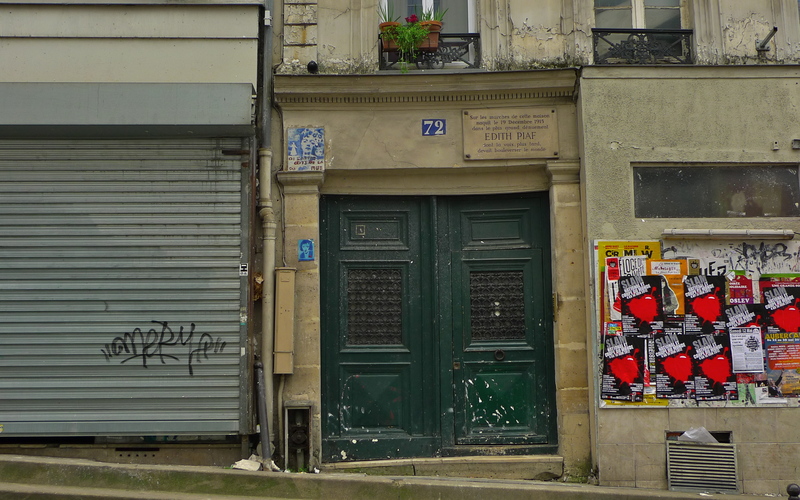 EVEN THOUGH HER birth certificate cites the Hôpital Tenon, some say that Édith Giovanna Gassion, later known as Edith Piaf, ‘La Môme Piaf’, was born outside this house, N° 72 rue de Belleville, under a lamppost in the snow. 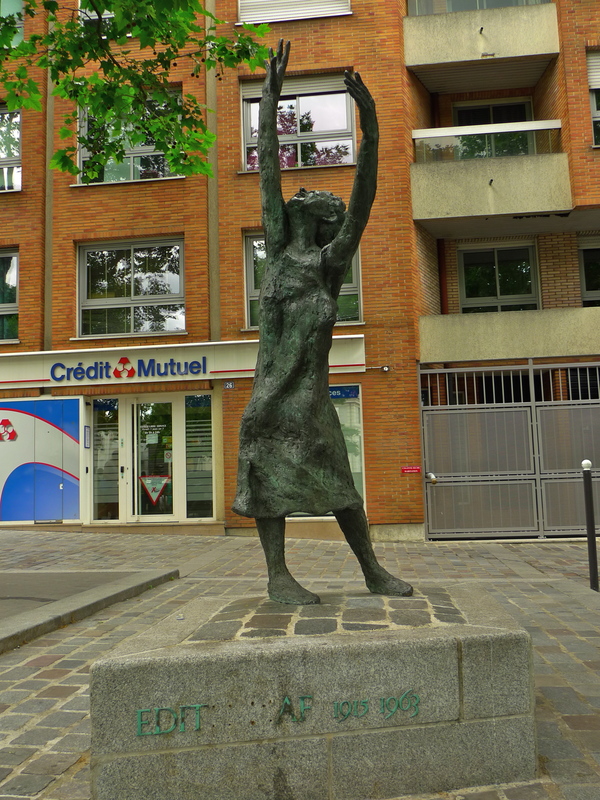 Not far away and still in the 20th arrondissement, in the triangle between rue Belgrand, rue du Capitaine Ferber and rue de la Py, is the Place Edith Piaf, home to a bronze statue of the ‘Little Sparrow’. The statue was created by the French sculptor, Lisbeth Delisle and inaugurated by Bertrand Delanoë, Mayor of Paris, on 11th October 2003, forty years after Edith Piaf’s death. For much of her early life, Edith Piaf was a street entertainer in Pigalle, Belleville, Ménilmontant and the Paris suburbs. 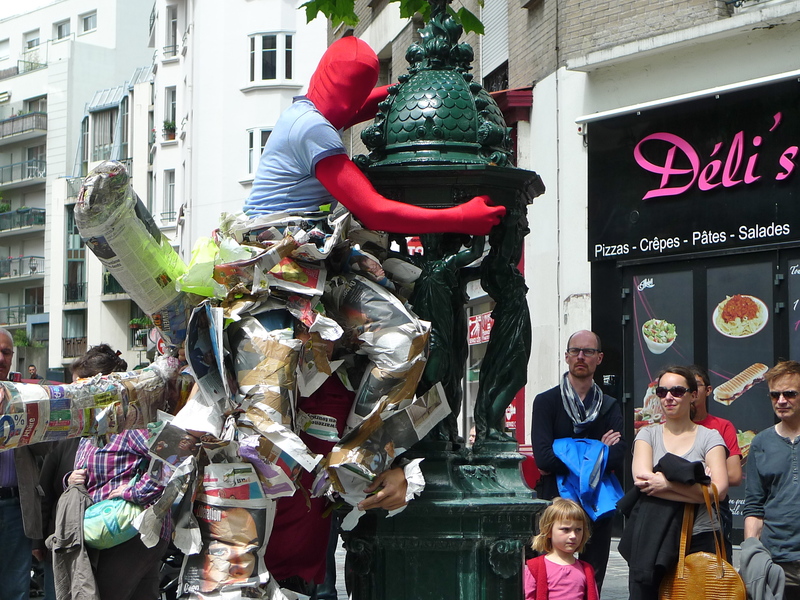 On Saturday, I discovered that the tradition of street entertaining continues in these parts. In the Place Edith Piaf the contemporary dance company, Mi-Octobre, were performing as part of the ‘Et 20 l’été’ festival – a 20th arrondissement summer arts festival. The Mi-Octobre company was founded by the French choreographer Serge Ricci in 1994. It comprises dancers, visual artists, musicians, sound, lighting and costume designers, all of whom collaborate to create new, experimental productions. 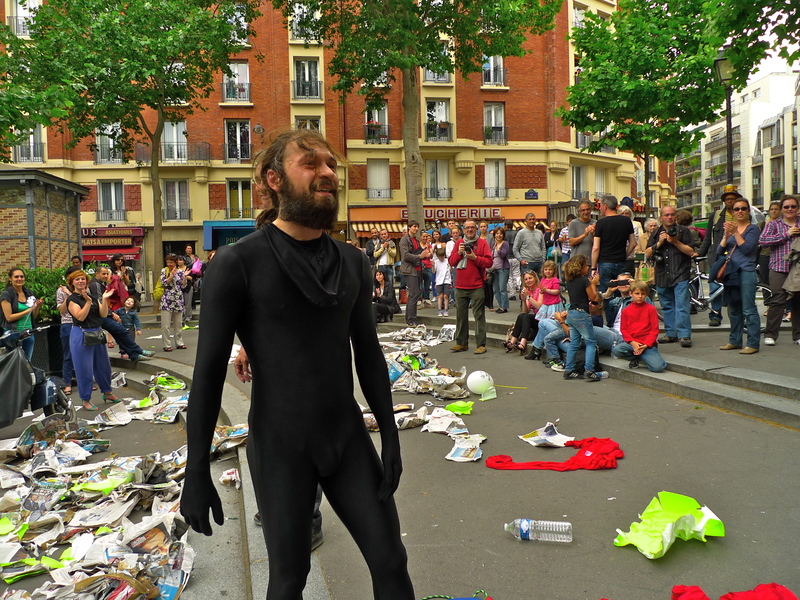 On Saturday they were performing a piece called Les Hommes Scotchés, roughly translated as ‘Taped Men’, a dance and visual art performance that invites us to take an alternative view of the world that surrounds us. 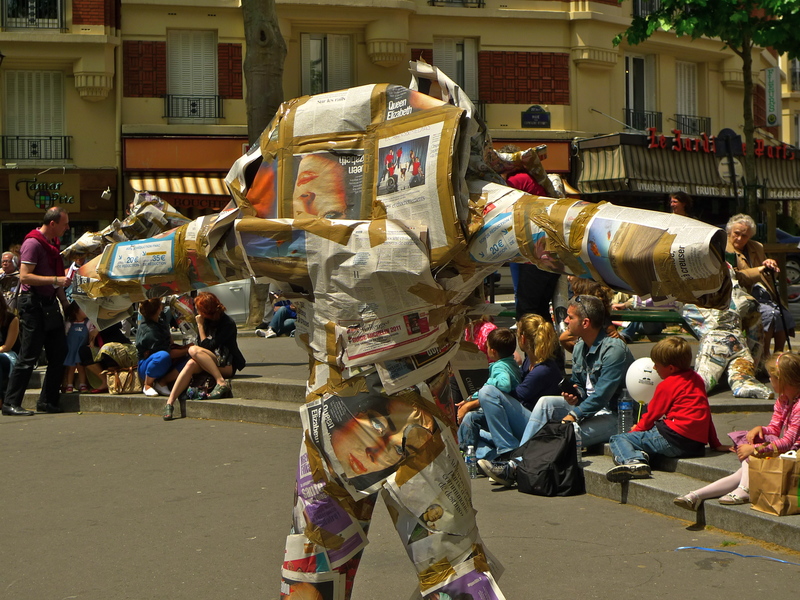 The performance began with two dancers each completely encased in newspaper held together with scotch tape. Robot like they began to move, gradually divesting themselves of their newspaper casing as they interacted with the audience. 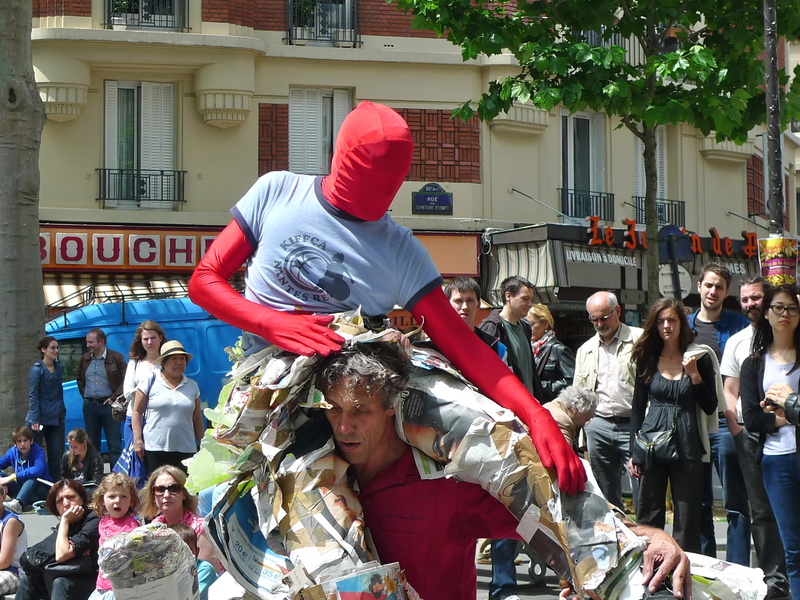 The piece ended with the dancers stripped of their newspaper casing and their red skins disappearing up the rue du Capitaine Ferber like black shadows. I cannot say that I’m an expert in contemporary dance and I admit that some of the deeper meaning of the piece may have passed me by but I did enjoy it nevertheless. I especially enjoyed the sound, which was specially composed to accompany the piece. I spend a lot of time walking the streets of Paris hunting out new sights and sounds and it’s always a delight when I come across something like Les Hommes Scotchés – especially with Edith Piaf looking on. 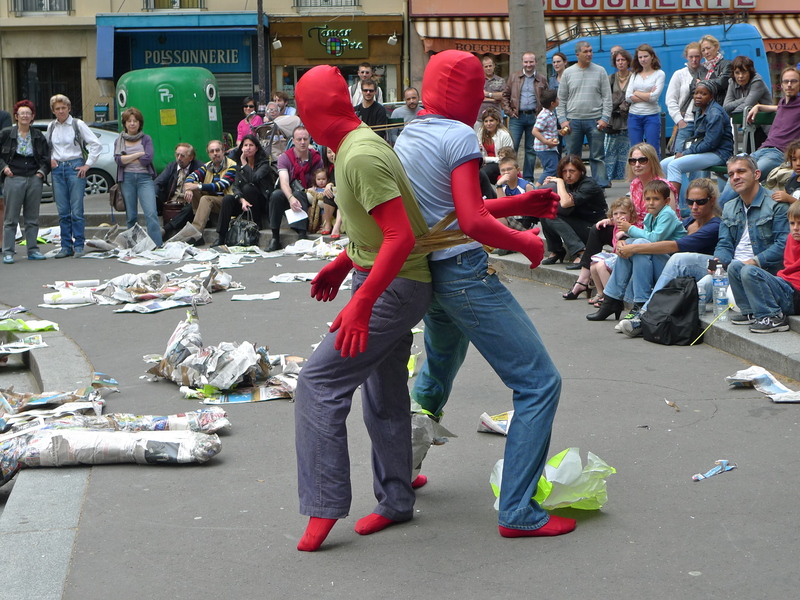 Les Hommes Scotchés was created by Serge Ricci & Fabien Almakiewicz and the performers were Fabien Almakiewicz, Yann Cardin and Marc Planceon.